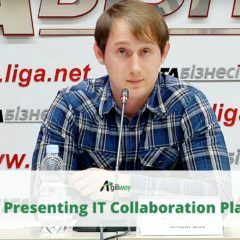 There is a new success Agiliway would like to share – a collaboration platform ROI4CIO, which we have been developing and successfully released in October, was presented at the press conference ‘IT Startup Saves Money for IT Technology Buyers’. Oleg Pitsyk, the PM of our development team, shed the light on key points of the project, benefits of ROI, and its advantages for clients. ROI4CIO is a collaboration platform that allows IT managers, depending on the business needs and challenges, to pick up the most suitable IT solution, to calculate the budget for its implementation and the return on investment from the given IT solutions. The goal of the project is to calculate the benefits of IT products before they are introduced into the company and show feedback on the results of the implementation. The first stage of the working process was the development of a solution that can be used as a single platform for gathering all information from the entire IT market. Next, we improved the complex logic of automatic calculation of prices and benefits and developed the communication between all project participants. The last stage was connected with the development of a neural network for the search of potential partners, suitable products and solutions, expansion of its portfolio. Supportable – the technology allows easy and unexpressive support in the future. MariaDB for quicker data processing. ROI4CIO, developed by Agiliway, is going to help our client become a worthy competitor to already existing distributors of IT solutions on EU and CIS markets, grow the number of partners, and provide the effective tool for an end-user to select potential IT solutions by modeling and comparing ROI since it’s the one-of-the-kind platform.